Let’s start today with what, in some ways, may be one of the most interesting looks at how movies are being made today. Of course, we all know that much of what we actually see in the final product that appears on the screen is not the product of movie makers venturing outside the studio, finding the perfect location, assembling all of the actors, crew, and others that are necessary for shooting, hoping that the lighting is right, taking into account the weather and whatever other variables may need to be accounted for, and then committing the results to film. Instead, much of the work is done inside a studio, shot with digital cameras, then later processed by people working on computers to provide backgrounds, the proper atmosphere, etc. That fact is something we all simply either take for granted, ignore, or are simply unaware of. Of course, if you’ve been following any of the debate over digital movie making over shooting on film, you’ve likely seen various video outtakes showing how objects or locations may be changed or enhanced after shooting in order to fit into the directors vision. Sometimes, however, it’s surprising just how little of a movie is actually what most people would consider “real” – in other words. how little of it actually does involve interaction with actual locations or even objects that appear within the scene. 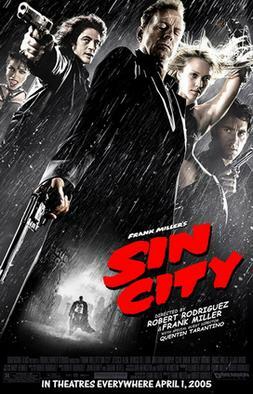 Which brings us to a very interesting video put together by the co-director (along with original graphic novel writer/artist Frank Miller and “special guest director” Quentin Tarantino) of 2005’s Sin City, Mr. Robert Rodriguez. So, just exactly how did they get this particular look? Well, there’s obviously a lot of digital manipulation going on after the shooting was done. Color correction, cgi blood, etc. All the things we’ve pretty much come to expect when watching big blockbusters today. But what may surprise you is just how much of the movie was made in a computer. That’s where what Mr. Rodriguez’s is calling “The All Green Version” comes in. I have to admit that upon first viewing this, the only reaction I had was a rather stunned “Wow.”. Now, of course, there are all kinds of debates that could be had stemming from this. Obviously, there is the whole digital versus film discussion. Some, of course, would argue that making a movie this way is “cheating”. But I wonder actually just how different this type of movie making is from it’s original studio-bound origins. Let’s not forget that from its earliest days, narrative film making (as opposed to documentaries, for example) has been all about creating illusions on the screen. When one gets right down to it, how different is the clip above from what we see in this trailer for the highly-acclaimed German expressionist film The Cabinet of Dr. Caligary? Obviously, Caligary, with its tilted camera angles and set-design where everything is at least slightly (and usually very-much) askew is going for a particular look that helps in evoking the tone and impact of the scenes it is presenting, but if one is honest, isn’t that exactly what Rodriguez and his cohorts were doing also? 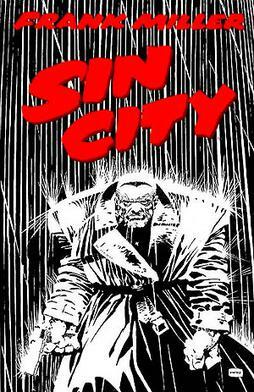 Really, in some ways, other than the fact that the sets for Robert Wiene’s film had to be built by hand before the film could be made, rather than in a computer afterwards, it could be argued that Sin City is actually a throw-back film to those earliest days of movie making where everything else was in service to telling the story, to realizing the look and feel – the vision, if you will – that the director was going for on the big screen. And in the end, isn’t that what real visionary movie making is all about?